The Nuclear Regulatory Commission (NRC) is an independent agency of the United States government tasked with protecting public health and safety related to nuclear energy. Established by the Energy Reorganization Act of 1974, the NRC began operations on January 19, 1975 as one of two successor agencies to the United States Atomic Energy Commission. Its functions include overseeing reactor safety and security, administering reactor licensing and renewal, licensing radioactive materials, radionuclide safety, and managing the storage, security, recycling, and disposal of spent fuel. Prior to 1975 the Atomic Energy Commission was in charge of matters regarding radionuclides. The AEC was dissolved, because it was perceived as unduly favoring the industry it was charged with regulating. The NRC was formed as an independent commission to oversee nuclear energy matters, oversight of nuclear medicine, and nuclear safety and security. The U.S. AEC became the Energy Research and Development Administration (ERDA) in 1975, responsible for development and oversight of nuclear weapons. Research and promotion of civil uses of radioactive materials, such as for nuclear non-destructive testing, nuclear medicine, and nuclear power, was split into the Office of Nuclear Energy, Science & Technology within ERDA by the same act. In 1977, ERDA became the United States Department of Energy (DOE). In 2000, the National Nuclear Security Administration was created as a subcomponent of DOE, responsible for nuclear weapons. A 1986 Congressional report found that NRC staff had provided valuable technical assistance to the utility seeking an operating license for the controversial Seabrook plant. In the late 1980s, the NRC 'created a policy' of non-enforcement by asserting its discretion not to enforce license conditions; between September 1989 and 1994, the 'NRC has either waived or chosen not to enforce regulations at nuclear power reactors over 340 times'. Finally, critics charge that the NRC has ceded important aspects of regulatory authority to the industry's own Institute for Nuclear Power Operations (INPO), an organization formed by utilities in response to the Three Mile Island Accident. The NRC has produced a booklet, A Short History of Nuclear Regulation 1946–2009, which outlines key issues in NRC history. Thomas Wellock, a former academic, is the NRC historian. Before joining the NRC, Wellock wrote Critical Masses: Opposition to Nuclear Power in California, 1958–1978. The NRC is headed by five Commissioners appointed by the President of the United States and confirmed by the United States Senate for five-year terms. One of them is designated by the President to be the Chairman and official spokesperson of the Commission. The current chairman is Kristine Svinicki. President Donald Trump designated Svinicki as Chairman of the NRC effective January 23, 2017. Kristine Svinicki is the chairman of the NRC. There are altogether 17 Executive Director for Operations offices: Office of Federal and State Materials and Environmental Management Programs, Office of New Reactors, Office of Nuclear Material Safety and Safeguards, Office of Nuclear Reactor Regulation, Office of Nuclear Regulatory Research, Office of Enforcement, which investigates reports by nuclear power whistleblowers, specifically the Allegations Program, Office of Investigations, Office of Nuclear Security and Incident Response, Region I, Region II, Region III, Region IV, Office of Information Services, Computer Security Office, Office of Administration, Office of the Chief Human Capital Officer, and Office of Small Business and Civil Rights. NRC headquarters offices are located in unincorporated North Bethesda, Maryland (although the mailing address for two of the three main buildings in the complex list the city as Rockville, MD), and there are four regional offices. 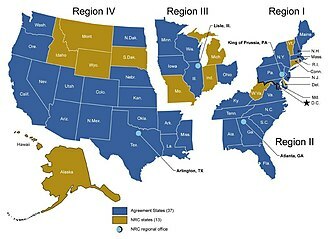 The NRC territory is broken down into four geographical regions; until the late 1990s, there was a Region V office in Walnut Creek, California which was absorbed into Region IV, and Region V was dissolved. Region I, located in King of Prussia, Pennsylvania, oversees the northeastern states. Region II, located in Atlanta, Georgia, oversees most of the southeastern states. Region III, located in Lisle, Illinois, oversees the Midwest. Region IV, located in Arlington, Texas, oversees the western and south central states. The 1982 Nuclear Waste Policy Act directed NRC in Section 306 to issue regulations or "other appropriate regulatory guidance" on training of nuclear plant personnel. Since the nuclear industry already had developed training and accreditation, NRC issued a policy statement in 1985, endorsing the INPO program. NRC has a memorandum of agreement with INPO and "monitors INPO activities by observing accreditation team visits and the monthly NNAB meetings". Terrorist attacks such as those executed by al-Qaeda on New York City and Washington, D.C. on September 11, 2001 and in London on July 7, 2005 have prompted fears that extremist groups might use radioactive dirty bombs in further attacks in the United States and elsewhere. In March 2007, undercover investigators from the Government Accountability Office set up a false company and obtained a license from the Nuclear Regulatory Commission that would have allowed them to buy the radioactive materials needed for a dirty bomb. According to the GAO report, NRC officials did not visit the company or attempt to personally interview its executives. Instead, within 28 days, the NRC mailed the license to the West Virginia postal box. Upon receipt of the license, GAO officials were able to easily modify its stipulations, and remove a limit on the amount of radioactive material they could buy. A spokesman for the NRC said that the agency considered the radioactive devices a "lower-level threat"; a bomb built with the materials could have contaminated an area about the length of a city block, but would not have presented an immediate health hazard. Between 2007 and 2009, 13 companies applied to the Nuclear Regulatory Commission for construction and operating licenses to build 25 new nuclear power reactors in the United States. However, the case for widespread nuclear plant construction was eroded due to abundant natural gas supplies, slow electricity demand growth in a weak U.S. economy, lack of financing, and uncertainty following the Fukushima nuclear disaster. Many license applications for proposed new reactors were suspended or cancelled. Only a few new reactors will enter service by 2020. These will not be the cheapest energy options available, but they are an attractive investment for utilities because the government mandates that taxpayers pay for construction in advance. In 2013, four aging reactors were permanently closed: San Onofre 2 and 3 in California, Crystal River 3 in Florida, and Kewaunee in Wisconsin. Vermont Yankee, in Vernon, was shut down on December 29, 2014, following many protests. New York State is seeking to close Indian Point Energy Center, in Buchanan, 30 miles from New York City. Barack Obama, when running for president in 2007, said that the five-member NRC had become "captive of the industries that it regulates"
Numerous different observers have criticized the NRC as an example of regulatory capture The NRC has been accused of having conflicting roles as regulator and "salesman" in a 2011 Reuters article, doing an inadequate job by the Union of Concerned Scientists. And the agency approval process has been called a "rubber stamp". A worker (named George Galatis) at the Millstone Nuclear Power Plant in Connecticut kept warning management, that the spent fuel rods were being put too quickly into the spent storage pool and that the number of rods in the pool exceeded specifications. Management ignored him, so he went directly to the NRC, which eventually admitted that it knew of both of the forbidden practices, which happened at many plants, but chose to ignore them. The whistleblower was fired and blacklisted. In Vermont, the day before the 2011 Tōhoku earthquake and tsunami that damaged Japan's Fukushima Daiichi Nuclear Power Plant, the NRC approved a 20-year extension for the license of Vermont Yankee Nuclear Power Plant, although the Vermont state legislature voted overwhelmingly to deny an extension. The plant had been found to be leaking radioactive materials through a network of underground pipes, which Entergy had denied under oath even existed. At a hearing in 2009 Tony Klein, chairman of the Vermont House Natural Resources and Energy Committee had asked the NRC about the pipes and the NRC also did not know they existed. In March 2011, the Union of Concerned Scientists released a study critical of the NRC's 2010 performance as a regulator. The UCS said that over the years, it had found the NRC's enforcement of safety rules has not been "timely, consistent, or effective" and it cited 14 "near-misses" at U.S. plants in 2010 alone. In April 2011, Reuters reported that diplomatic cables showed NRC sometimes being used as a sales tool to help push American technology to foreign governments, when "lobbying for the purchase of equipment made by Westinghouse Electric Company and other domestic manufacturers". This gives the appearance of a regulator which is acting in a commercial capacity, "raising concerns about a potential conflict of interest". Gregory Jaczko was Chairman of the NRC when the 2011 Fukushima disaster occurred in Japan. Jaczko looked for lessons for the US, and strengthened security regulations for nuclear power plants. For example, he supported the requirement that new plants to be able to withstand an aircraft crash. On February 9, 2012 Jaczko cast the lone dissenting vote on plans to build the first new nuclear power plant in more than 30 years when the NRC voted 4–1 to allow Atlanta-based Southern Co to build and operate two new nuclear power reactors at its existing Vogtle Electric Generating Plant in Georgia. He cited safety concerns stemming from Japan's 2011 Fukushima nuclear disaster, saying "I cannot support issuing this license as if Fukushima never happened". In July 2011, Mark Cooper said that the Nuclear Regulatory Commission is "on the defensive to prove it is doing its job of ensuring safety". In October 2011, Jaczko described "a tension between wanting to move in a timely manner on regulatory questions, and not wanting to go too fast". In 2011 Edward J. Markey, Democrat of Massachusetts, criticized the NRC's response to the Fukushima Daiichi nuclear disaster and the decision-making on the proposed Westinghouse AP1000 reactor design. The petition seeks suspension of six existing reactor license renewal decisions (Columbia Generating Station, WA Davis-Besse Nuclear Power Station, OH, Diablo Canyon Power Plant, CA, Indian Point Energy Center, NY, Pilgrim Nuclear Generating Station, MA, and Seabrook Station Nuclear Power Plant, NH); 13 new reactor combined construction permit and operating license decisions (Bellefonte Nuclear Generating Station Units 3 and 4, AL, Bell Bend, Callaway Nuclear Generating Station, MO, Calvert Cliffs Nuclear Generating Station, MD, Comanche Peak Nuclear Power Plant, TX, Enrico Fermi Nuclear Generating Station, MI, Levy County Nuclear Power Plant, FL North Anna Nuclear Generating Station, VA, Shearon Harris Nuclear Power Plant, NC, South Texas Nuclear Generating Station, TX, Turkey Point Nuclear Generating Station, FL, Alvin W. Vogtle Electric Generating Plant, GA, and William States Lee III Nuclear Generating Station, SC);a construction permit decision (Bellefonte Units 1 and 2); and an operating license decision (Watts Bar Nuclear Generating Station, TN). In addition, the petition asks the NRC to halt proceedings to approve the standardized AP1000 and Economic Simplified Boiling Water Reactor designs. The petitioners asked the NRC to supplement its own investigation by establishing an independent commission comparable to that set up in the wake of the less severe 1979 Three Mile Island accident. The petitioners included Public Citizen, Southern Alliance for Clean Energy, and San Luis Obispo Mothers for Peace. The Oconee Nuclear Station has been shown to be at particular risk from flooding. An NRC letter dated 2009 states that "a Jocassee Dam failure is a credible event" It goes on to state that "NRC staff expressed concerns that Duke has not demonstrated that the [null Oconee Nuclear Station] units will be adequately protected." This raised a second and potentially larger issue. NRC recently completed its license renewal program which extended the operating licenses of the nation's fleet of nuclear reactors for an additional 20 years. NRC stated that the probability of a severe accident is so incredible that the consequences can be dismissed from the analysis of impacts in its relicensing environmental impact statements (EIS).Environmental impact statement Yet this conflicts with NRC's internal analyses which concluded that flooding presented a serious human and environmental risk. Critics charge that if these relicensing EISs failed to evaluate the risks of flooding, then how can the public be confident that NRC did not mislead stakeholders concerning other risks such as the potential for a nuclear meltdown. ^ a b c NRC (2013). "NRC history". NRC website. ^ "NRC: A Short History of Nuclear Regulation, 1946–2009 (NUREG/BR-0175, Revision 2)". www.nrc.gov. Retrieved 2018-03-04. ^ a b "Chairman Kristine L. Svinicki". Retrieved 6 April 2017. ^ "Stephen G. Burns". Retrieved 6 April 2017. ^ "Former NRC Commissioners". Nuclear Regulatory Commission. Retrieved 6 April 2017. ^ a b "Organization & Functions". website. NRC. 27 November 2013. Retrieved 21 May 2014. ^ "Federal Register NRC". Federal Register. Retrieved 21 May 2014. ^ "Congressional Budget Justification: Fiscal Year 2015 (NUREG-1100, Volume 30)". NUREG-1100, Volume 30. NRC. March 2014. Retrieved 21 May 2014. ^ "NRC Document Collections". website. NRC. Retrieved 21 May 2014. ^ "FAQ About the Agencywide Documents Access and Management System". website. NRC. Retrieved 21 May 2014. ^ US Congress. House Committee on Science and Technology. Subcommittee on Energy Research and Production, US President's Commission on the Accident at Three Mile Island (1980). "Kemeny Commission findings: Oversight". Committee Report. U.S. Govt. Print. Off. pp. 40–129. Retrieved 21 May 2014. ^ Lanouette, William (January 1980). "The Kemeny Commission Report". Bulletin of the Atomic Scientists: 20–24. Retrieved 21 May 2014. ^ NEI (2014). "National Academy for Nuclear Training Program". websute. Nuclear Energy Institute nei.org. Retrieved 21 May 2014. ^ "PG&E Senior Vice President Appointed to National Nuclear Accrediting Board". website. Pacific Gas and Electric Corporation. 11 February 2013. Retrieved 21 May 2014. The independent National Nuclear Accrediting Board evaluates operator and technical training programs for nuclear plants throughout the industry, ensuring that accredited training programs meet the highest standards for excellence and incorporate best practices. ^ NRC (September 2001). "The United States of America National Report for the Convention on Nuclear Safety". NUREG-1650. NRC. pp. 11–15. Retrieved 21 May 2014. In accordance with its memorandum of agreement with the Institute of Nuclear Power Operations (INPO), the NRC monitors INPO accreditation activities as part of its assessment of the effectiveness of the industry's training programs. (The NRC also monitors the selected performance areas of its licensees as part of its assessment.) The NRC monitors INPO activities by observing accreditation team visits and the monthly National Nuclear Accrediting Board meetings. ^ a b NRc. "Related Documents and Other Resources". website. ^ NRC (February 9, 1994). "Renewal of Licenses and Requalification Requirements for Licensed Operators". Federal Register Volume 59, Number 27. Government Printing Office. Retrieved 21 May 2014. ^ NRC (23 April 1999). "Initial Licensed Operator Examination Requirements". Federal Register Volume 64, Number 78. Government Printing Office. Retrieved 21 May 2014. ^ NRC (23 April 1999). "Subpart E—Written Examinations and Operating Tests". NRC Regulations (10 CFR) PART 55—Operators licenses, § 55.40 Implementation. NRC. Retrieved 21 May 2014. ^ NRC (20 September 2000). "Staff Meetings Open to the Public: Final Policy Statement". Federal Register Volume 65 Number 183. Government Printing Office. Retrieved 21 May 2014. ^ Jay Davis (25 March 2008). "After A Nuclear 9/11". Washington Post. ^ Averting Catastrophe Archived 2010-06-07 at the Wayback Machine p. 338. ^ Nicholas Kristof (10 March 2004). "A Nuclear 9/11". NY Times. ^ "A Nuclear Ruse Uncovers Holes in U.S. Security". NY Times. 12 July 2012. ^ a b Ayesha Rascoe (Feb 9, 2012). "U.S. approves first new nuclear plant in a generation". Reuters. ^ Eileen O'Grady. Entergy says nuclear remains costly Reuters, May 25, 2010. ^ Terry Ganey. AmerenUE pulls plug on project Archived 2012-07-13 at the Wayback Machine Columbia Daily Tribune, April 23, 2009. ^ Matthew Wald (June 11, 2013). "Atomic Power's Green Light or Red Flag". New York Times. ^ "Experts: Even higher costs and more headaches for nuclear power in 2012". MarketWatch. 28 December 2011. ^ a b Justin Elliott (17 March 2011). "Ex-regulator flacking for pro-nuke lobby". Salon.com. Retrieved 18 March 2011. ^ Daniel Kaufmann (April 1, 2011). "Preventing Nuclear Meltdown: Assessing Regulatory Failure in Japan and the United States". Brookings. Archived from the original on April 6, 2011. ^ a b Ben Berkowitz & Roberta Rampton (April 18, 2011). "Exclusive: U.S. nuclear regulator a policeman or salesman?". Reuters. ^ Hannah Northey (28 March 2011). "Japanese Nuclear Reactors, U.S. Safety to Take Center Stage on Capitol Hill This Week". New York Times. ^ a b c Kate Sheppard (17 March 2011). "Is the Government's Nuclear Regulator Up to the Job?". Mother Jones. Retrieved 18 March 2011. ^ Frank Von Hippel (23 March 2011). "It Could Happen Here". New York Times. ^ Charles Perrow (November–December 2011). Fukushima and the inevitability of accidents. Bulletin of the Atomic Scientists. vol. 67 no. 6. pp. 44–52. ^ Jia Lynn Yang (March 18, 2011). "Democrats step up pressure on nuclear regulators over disaster preparedness". The Washington Post. Retrieved 19 March 2011. ^ Onell R. Soto (April 28, 2011). "Anti-nuclear protest planned at NRC meeting". SignOnSanDiego. ^ Matthew Wald (October 4, 2011). "The N.R.C. Goes Social". New York Times. ^ Matthew L. Wald (July 28, 2011). "U.S. Regulator Says Fukushima Lessons Can Percolate". New York Times. ^ Peter Fairley (March 15, 2011). "Fukushima's Spreading Impact". Technology Review. ^ a b c "Fukushima Fallout: 45 Groups and Individuals Petition NRC to Suspend All Nuclear Reactor Licensing and Conduct a "Credible" Three Mile Island-Style Review". PRNewswire. April 14, 2011. ^ Carly Nairn (14 April 2011). "Anti nuclear movement gears up". San Francisco Bay Guardian. ^ a b Zeller, Tom (October 19, 2012). "Leaked Report Suggests Long-Known Flood Threat To Nuclear Plants, Safety Advocates Say". Huffpost. ^ "Union of Concerned Scientists, Dam Failures and Flooding at U.S. Nuclear Plant" (PDF). ^ Matthew Wald (June 15, 2011). "U.S. Reactors Unprepared for Total Power Loss, Report Suggests". New York Times. ^ Andrew Restuccia (2011-10-20). "Nuke regulators toughen safety rules". The Hill. Archived from the original on 2012-01-14. ^ "NRC chair warns nuclear industry against complacency, says it must resolve long-running issues". Washington Post. 11 November 2011. Wikimedia Commons has media related to Nuclear Regulatory Commission.